Here it comes! Just two more days until the arrival of the Chelsea Music Festival 2013 Opening Night! Which obviously means two more days until the gala where dinner, well, hors d’oeuvres are served. I’m looking forward to it as anticipation builds. As the time nears, the beat of my heart cheers. I stuffed my bag last night with little more than the bare necessities, namely my chef whites and knife roll. Just a reminder of what I’m so excitedly headed into: The Chelsea Music Festival is a collaborative exhibition of musical, visual, and culinary arts displayed within dazzling venues of lower Manhattan. Last year a perfumer even took part. Of course, as the name suggests, music is key. Yet, the Tip of the Tongue shall savor food above all else, forevermore. I’m not sure how much I truly know, for that matter. I’ve spoken to Sonar, trying to get him to spill the beans- or whatever it is he’s cooking up in preparation for the Festival events. He didn’t budge much as he’s very occupied. But I did do a little bit of research on myself-my most substantial findings revealed on CMF’s website (Creepy?). 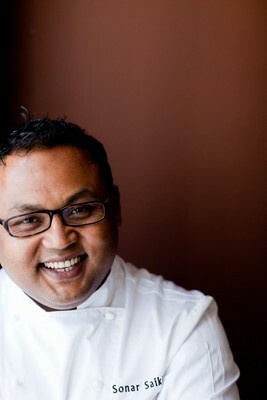 Sonar (who humbly declines the title chef, as it is to be earned) was once a tea farmer in the city of India. But he’s spent most of his life here in the United States (I believe). His American life began in Tennessee, where he took part in launching a barbecue joint, getting down and dirty. He sought to refine his culinary craft at New York City’s renowned French Culinary Institute. He has served his time working in the trenches of a number of kitchens across the City, including Jean- George’s Mercer Kitchen and Kurt Gutenbrunner’s Wallse. He is currently a key player on JP Morgan Chase and Co.’s corporate dining team. Regardless of how far he’s come, his Indian roots will, perhaps, give him some sort of poise in the field of British cuisine. All in all, although what I was looking for was details, Saikia didn’t seem too much entangled in them. He conveyed a modest, yet, candid approach to food in general and the food to be served in Chelsea. He sounds like he’s all about fun when it comes to food, casting away all pretension and welcoming the exchange of philosophies and of expertise. I look forward to meeting him; and, prayerfully, I’ll have something worthy of bringing to the table. I dare not venture too far from the table, however. One thing I love about the Chelsea Music Festival is the mingling of the arts: how in the midst of the cadence of the kitchen, one distinguishes the harmony of the orchestra. Unfortunately, though, I will not have that opportunity this year. I will be around to handle the preliminaries and must be gone. Nevertheless, I’m looking forward stirring up a tune of my own, and reproducing the visual masterpieces of the culinary artist-in-residence. But as for you, should your schedule allow, go check it out! It’s a great crowd that knows how to have a great time with a great sense of class. Let the countdown resume!